Common oregano is botanically known as Origanum vulgare, Greek for "joy of the mountains." It can be found growing wild on mountainsides of Greece and other Mediterranean countries where it is an herb of choice. Also known as wild marjoram, the oregano plant is a perennial which grows up to two feet tall and bears tiny leaves which lend a pungent aroma and strong flavor to a variety of savory foods. When in bloom, the plant sports pink or purple flowers, which are also edible. The leaves are used fresh from the plant or dried. 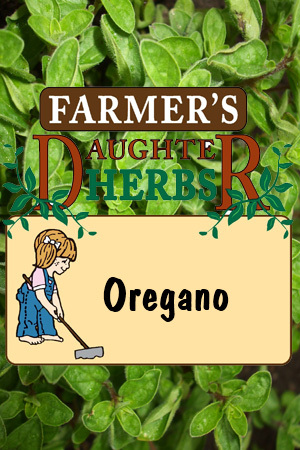 Oregano is one of the few herbs that is stronger when dried than when fresh. Commercially, oregano's biggest market is in perfumes. Oregano, commonly called "the pizza herb," is one of the most widely-used herbs worldwide, so it is hard to imagine anyone not having tried it. However, oregano was virtually unused in America until returning World War II soldiers heightened the popularity of pizza. In fact, sales of oregano increased by 5200 percent between 1948 and 1956 due to pizzamania. Yet oregano to one person may be something completely different to another, as it is easily confused with its close relative, marjoram. There are a number of different varieties of oregano. The strongest is considered to be Mexican oregano (Lippia graveolens), which is actually from a different botanical family. Mexican oregano is also known as Mexican marjoram or Mexican wild sage, and if your recipe calls for this specifically, try not to substitute. Spanish (Origanum vivens) and Greek (Origanum heraclites) oregano follow in depth of flavor. Adding more confusion to the mix is the close relationship between marjoram (Origanum majorana) and oregano, which naturally means they also look very much alike. While its gentler flavor is sweeter and its aroma not quite as pungent, marjoram is often confused with oregano. Sweet marjoram has leaves which are slightly hairy and more gray-green in color. 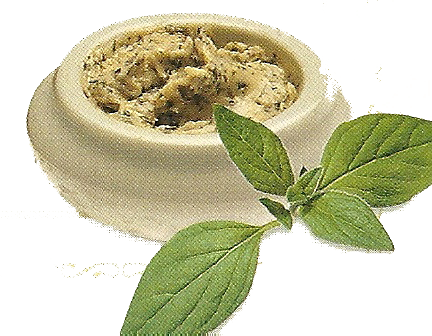 Homemade oregano butter is a tasty variation of one of the most common of household staples. In a mixer, blend 1-2 bunches of chopped oregano, 1-2 cloves of crushed garlic, 2 sticks of sweet butter and salt to taste. 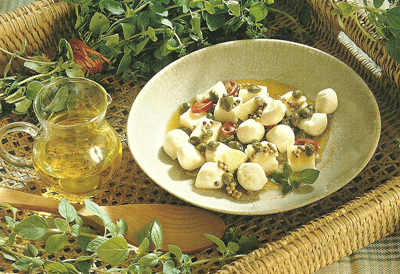 Served on bread fresh from the oven, oregano butter compliments soups, salads and pasta dishes. It's healthy too. The butter acts as a carrier for the herbs therapeutic essential oil. The essential oil in most Oregano species contains the constituents carvacrol and thymol, both recognized for their ability to help slow the growth of bacteria, loosen phlegm, soothe the digestive tract and destroy most fungi and worms. The herb also contains tannins, flavonoids, resin and bitters, which are said to stimulate the appetite and aid digestion. For cold symptoms, pour 1 cup of boiling water over 2 tsp. of the fresh herb. Steep for 10 minutes; strain. Drink the tea during the day as needed.